At present there are effective control and numerical methods and corresponding software for analysis and simulating different classes of ordinary differential equations (ODE) and partial differential equations (PDE). There are many applications for these types of equations, because of this progress, but there are not as many methodologies in systems with delays that are easily applicable for the engineer or applied mathematician. there are no methods of finding solutions in explicit forms, and there is an absence of generally available general-purpose software packages for simulating such systems. 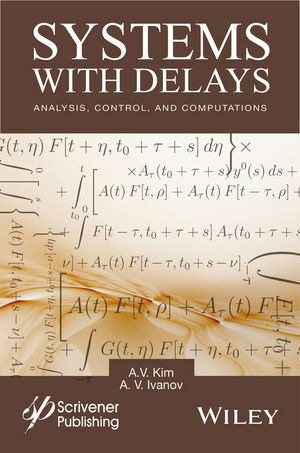 Systems with Delays fills this void and provides easily applicable methods for engineers, mathematicians, and scientists to work with delay differential equations in their operations and research. A.V. Kim, PhD, is the head of the Functional Differential Equation group at the Institute of Mathematics and Mechanics of the Russian Academy of Sciences (Ural Branch) and is the lead researcher at the Key Center of Excellence at the Ural Federal University. ?In 1997-1999, while developing the Time-Delay System Toolbox, he worked at the Control Information System Laboratory at the School of Electrical Engineering at the Seoul National University. A. V. Ivanov is a researcher at the Functional Differential Equation group at the Institute of Mathematics and Mechanics of the Russian Academy of Sciences (Ural Branch) and is a researcher at the Key Center of Excellence at the Ural Federal University.